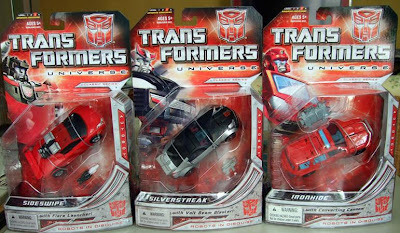 Transformers Universe wave 3 Deluxe figures Sideswipe, Silverstreak, and Ironhide have been spotted at Toys 'R' Us in Singapore. Judging by past sightings of Transformers at retail in Asia, these should be showing up in U.S. stores within a week or two. Also, tformers.com has posted a large batch of photos of Hasbro stock images showing upcoming Transformers in both the Animated and new 25th Anniversary lines, and there are some big surprises. Looking at the photos, I am really looking forward to the 25th Anniversary Starscream and Cyclonus, but it's especially nice to see some Beast Wars/Beast Machines figures in the mix too. Can't wait to find Ironhide! Found Cyclonus, Cheetor, and Hound on New Years Eve! But bought just Cyclonus. The figure I've been waiting to remade for over a decade has finally been released. Is this the holy grail? IT IS A NEW YEARS EVE MIRACLE!